This paper will begin with defining key terms, followed by explanation of the “what,” “why” and “how” of inter-disciplinary and integrative missiological research. Hopefully Christian scholars of multiple disciplines will collaborate in conducting research and Christian leaders will become better stewards of resources and opportunities by making informed decision based on validly collected data through research. To avoid complication, only five branches of missiological studies (i.e. 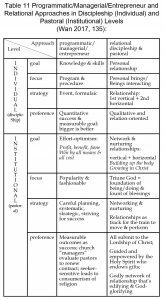 theory, theology, history, anthropology and strategy of Christian mission) are being included in Figure 1. “Missiological research” — “systematic and academic study (e.g. theory, theology, history, anthropology(intercultural studies), strategy of Christian mission) to continue on and carry out the missio Dei of the Triune Go, including investigation and interdisciplinary research. giving into the dehumanizing and depersonalizing forces of contemporary society (e.g. the critique of the Marxist, feminist, liberation theologians, etc.). power struggle among the intellectual elites of evangelical scholarship that are polarized by disciplinary differences, denominational division, etc. that would prevent genuine cooperation and collaboration of the best scholarship from various disciplines. Organizations such as ETS and EMS are the ideal venues for inter-disciplinary cooperative efforts of evangelical scholars/researchers to demonstrate the spirit of unity and to make significant contributions in the “kairos” moment of human history. 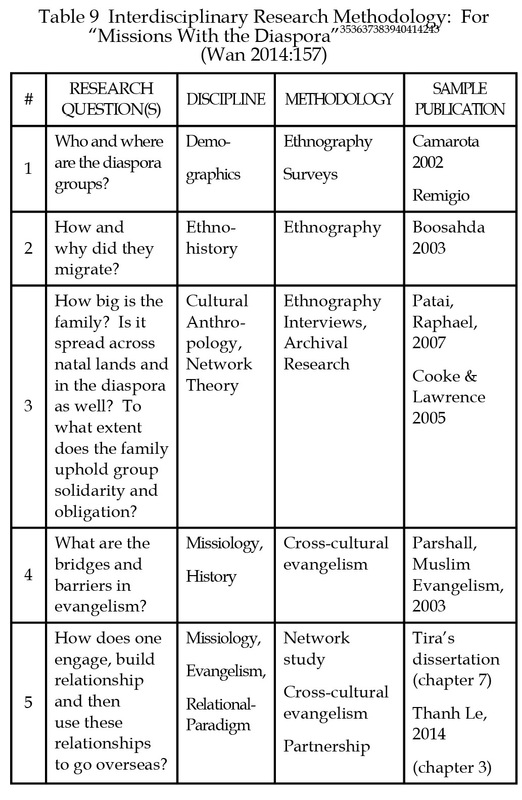 To not make things too complicated, we shall explain the importance and significance of missiological research by selectively choosing only five branches of missiological study as shown in Table 1. The diagrams below emerged from personal research, professional publication and two-decade-long coaching doctoral dissertation. 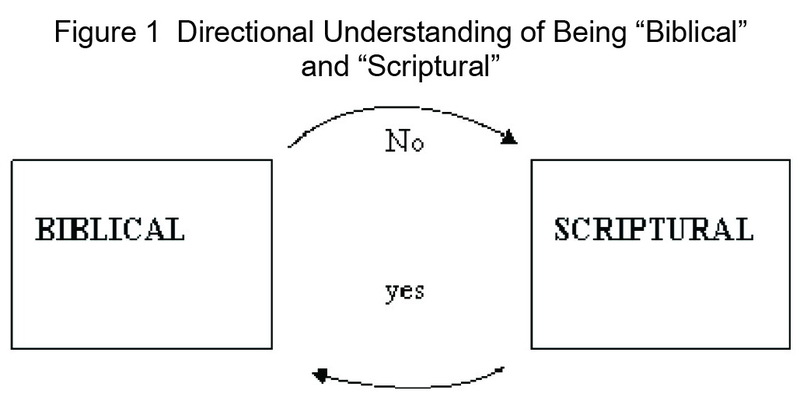 If inter-disciplinary research in missiological studies is conducted by following the five-step according to priority, then it will be characteristically evangelical, doctrinally sound and theologically grounded. Listed below are simple explanations of each of the five points in Table 2. Theologically Supported: Just based on pragmatism/expedience is insufficient; but sound theology is essential and required. Relevantly contextual: Not to be out of place; but it is to be required to be fitting for the context. Strategically practical: It is good to have scriptural/theological support with coherent theory and cultural relevance; but can be strategically put into practice. The Bible is full of “description” (#1 in the figure above) of behavior and practice of major figures in biblical times; but not “prescription” for us nowadays. For example, the Bible recorded/reported patriarch Abraham and King David as polygamist; but is prescriptive for us to be monogamist by the teaching of Jesus (Mt 19; Mk 10; Lk 16) and consistent teaching (Gen 1:14; Deut 24:13; Mal 2:15). Let us use another example to illustrate this point. The selection of a substitute for Judas after his suicide was by “casting lots” (Acts 1) so this way of selecting a leader is merely “biblical” (#2 in the Table 2). Should the Christian church follow that manner in identification and selection of leaders nowadays? In other words, casting lot as a form of decision-making as recorded/reported in Acts 1 is “biblically accurate” but not “scripturally binding” for us to follow today. There is a popular Christian hymn based on Ps 51:10-11, the psalm of confession written by King David after his adultery relationship with Bathsheba. However, though the hymn is “biblical” (based on Ps 51:10-11), it is theologically incorrect and inapplicable to us. The reason is that David’s confession is “particular” and being “time and place specific” (#3 of the figure above); but is not “universally” applicable to us because Jesus had promised that the Holy Spirit will “be with you forever” (Jn 14:16). King David’s confession and the hymn based on Ps 51 though being “biblical” but is not “scriptural.” The ceremonial law and sacrificial system of the OT is “biblical” as revealed by God in the OT and taught in the Pentateuch. The writer of Hebrews expounded the “scriptural meaning” of the old covenant and related Jewish traditions (#4 the Table above) for us – the NT Christians. The “scriptural teaching” of Hebrew is binding for all people at all times. Note: Not all men are husbands; but within thecontext of “traditional Christian marriage,” all husbands are men. 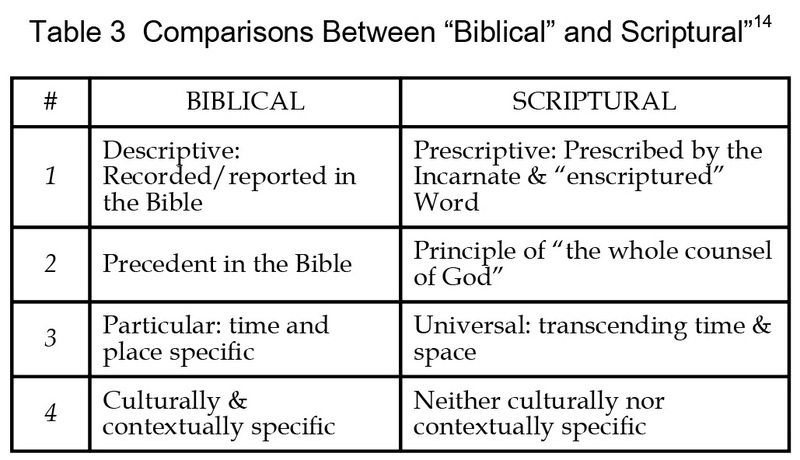 Likewise, whatever is “biblical” is not necessarily “scriptural;” but whatever is “scriptural” should also be “biblical.” Not only “biblical” and “scriptural” are different in meaning and usage, the proper order and the correct direction are also important. For example, when Jesus was tempted, Satan quoted verses from the OT so He is no doubt being “biblical.” However, his use of the Scripture is not “scriptural” at all. 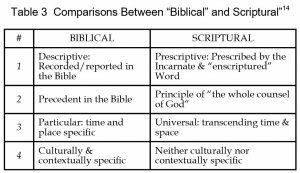 Jesus responded to Satan also by quoting verses from the OT (being “biblical”); but his usage is very different from that of Satan because He is both “biblical” and “scriptural” at the same time. The Christian faith and practice is to be consistently and coherently characterized by “love” – the Great Commandment of “love God” and “love thy neighbor” – point #3 in Table 2. 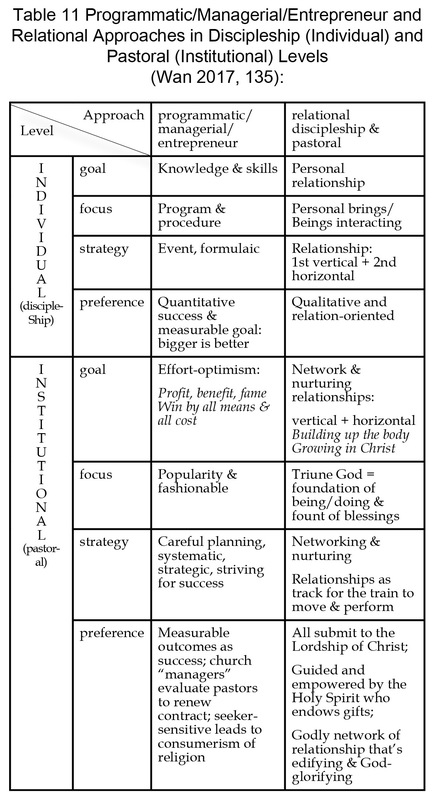 The “Gospel of wealth and health” and “the positive thinking” approach are popular these days because of “cultural relevance” of our time (point #4 in Table 2) and expedient/practical (point #5 in Table 2) with desirable outcomes quantitatively. However, evangelical Christians cannot ignore the importance of points 1, 2 and 3 in Table 2 and should not “conform to this world” (Ro 12: 1-2). 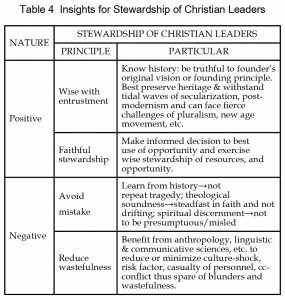 No statements of mission, vision, core values, and strategic goals of evangelical Christians should be embraced if they only measure up to points 4 and 5 but failed in 1, 2 and 3 of in Table 2. When not well integrated it could lead to eclectic staggering of elements that are not dynamically connected and synthetically interacting. The discipline with better development and more powerful approaches may absorb the others without true dynamic interaction and coherent integration. In the long path towards genuine inter-disciplinary research, practical problems such as mutual suspicions, disciplinary rivalry, methodological contention, etc. will prevent true integration. Unless hindrances (e.g. barriers and divisions) are removed and problems solved; practical difficulty will hinder the process and pursuit of cooperative inter-disciplinary research. Disciplinary Synergism: It integrates into a macro-paradigm what otherwise is a set of independent disciplines of study. The researcher is enabled to widen the scope of knowledge and is opened to see the whole in which the parts interact together for a more holistic understanding of reality and better theoretical formulations about that reality. Mutual Enrichment: There is potential for mutual enrichment among the disciplines which enter in a dynamic interaction. This enrichment would eventually mean mutual borrowing, questioning, and reformulating of what constituted an individual discipline method before entering into dynamic interaction. This process sharpens the precision of a research undertaking, thus securing results that are more systematic and closer to the reality of the subject matter under research. Research Advancement: This integrated inter-disciplinary approach in research processes, would also secure the right adjustments to problem solving and theoretical proposals for the explanation of phenomena under research. This in turn will increase the acuteness of implementing new paradigms into particular fields of practice or knowledge. In addition, the reality of the vastness of the created order, the diversity of human culture, the complexity of life, etc. requires that comprehensive and coherent understanding be informed by the findings of multiple disciplines and various fields. Disciplinary divide and extreme specialization – no integration: The trend of academic development and advancement is specialization personally and professionally. As long as the honor and compensation accorded to specialist continue to increase, there is the trendy tendency and personal preference to excel in a narrow field of study and smaller scope for research. Consequently the disciplinary divide increases and extreme specialization became prevalent. Academic incompetence and careless attempt in integration – low integration: If the point above is about “no integration,” here the concern is “low integration.” Integration research includes multiple dimensions: theoretical, thematic and methodological aspects. There are people with low standard for integration or with inadequate understanding of integration. They aim low and/or are simply incompetent, ending up with poor integration. Methodological fossilization – incomplete integration: Research process is to be dynamic and flexible in order to cope with unforeseen circumstances and even disastrous emergency. If a researcher believes a certain methodology and is too confident in the research design, he might suffer from methodological fossilization. One can start on the course of integration; but unable to make new adjustment in order to reach the finish line with consistent integration. If not consistently well integrated thought out the entire process, it will prevent one to reach dynamically the destination with thorough integration. Theoretical synthesis: An integrative research should demonstratively achieve theoretical synthesis. The author has had first hand experience as reported in summary format below. I spent years studying the doctrine of “The Trinity” and developed a “Trinitarian paradigm” that was the theoretical framework of all my publications on the topic of contextual theology for the Chinese (i.e. Sino-theology). For detail listing, on contextual theology for the Chinese and Sino-theology, see Appendix 1. For decades, I utilized “Trinitarian paradigm” to teach and coach doctoral dissertation such as: Hedinger, Mark R., “Towards a Paradigm of Integrated Missionary Training.” Unpublished dissertation. Western Seminary. Portland, 2006. Also with the use of “Trinitarian paradigm,” I practiced academic mentoring resulted in co-authorship with a student in article (i.e. Enoch Wan & Mark Hedinger, “Understanding “Relationality” From A Trinitarian Perspective,” Published in Global Missiology, Trinitarian Studies, January 2006, www.globalmissiology.org) and book (i.e. Enoch Wan & Mark Hedinger , Relational Missionary Training: Theology, Theory & Practice. CA: Urban Loft Publishers, 2017. Pioneering new field of study: Integration at multiple-level will include theoretical synthesis, methodological complementation, inter-disciplinary perspective, structural coherence and organizational unity. The author spent about two decades to develop “diaspora missiology” as a new missiological paradigm with theoretical formulation, methodological proposition and practical application. 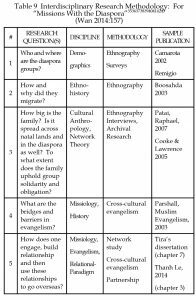 For detail listing of publications on “diaspora missiology” and inter-disciplinary methodology in diaspora missiology, see Appendix 2. Academic responsibility/integrity: Researchers benefit from the fruitful hard labors of those who preceded them, contributed to them by laying the groundwork or research foundation for them. These privileges enjoyed by latecomers to research bring with them academic responsibility to the scholarly community at large. Integrative researchers are to maintain academic integrity and in their turns to carry out their academic responsibility to fellow researchers and those of the new generation. Scholarly collaboration: In addition to the benefits of inter-disciplinary research, collaboration of scholars from different fields will surely be the best use of resources, reduce time, avoid redundancy, expedite research process/agenda and bearing fruitful outcomes. During my last sabbatical at Yale Divinity School, I discovered that there is not a “relational paradigm” in philosophy nor theology so I spent more than a decade to conduct research on the topic and sought scholarly collaboration from fellow researchers. Subsequently I was able to publish and produce with more frequency and higher quality articles/books on “relational paradigm.” For detail listing of publications on “relational paradigm” and inter-disciplinary methodology for research on “relational paradigm,” see Appendix 3. 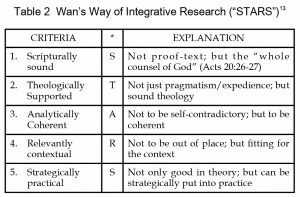 Enduring contribution: Integrative research that is of high quality and with the traits of “STARS” (Table 2), then the research findings should be scripturally sound, theologically grounded, analytically coherent, cross-culturally relevant, and practically applicable. Therefore, researchers can make enduring contributions; instead of chasing after façade. In terms of motivation, evangelical scholars share in common: “the cultural mandate (general),” the Great Commission (specific), and “the cultural war” (as illustrated by the works of Dockery 1995, Huntington 1996, Woodhouse 1996). There are three means for cooperation and collaboration: inter-disciplinary exploration, inter-institutional cooperation, long-term research project and publication. There are three mottoes for cooperation and collaboration: to the glory of the Father, in the name of the Son and by the empowerment of the Holy Spirit, and on the foundation of God’s Word – the Bible. Contemporary Christian churches have the tendency of being obsessed with efficiency and dismissing research to be unnecessary and a waste of time/energy. At the leadership, sometimes may even make uninformed decision, i.e. without knowing the hard facts to be gathered by research. 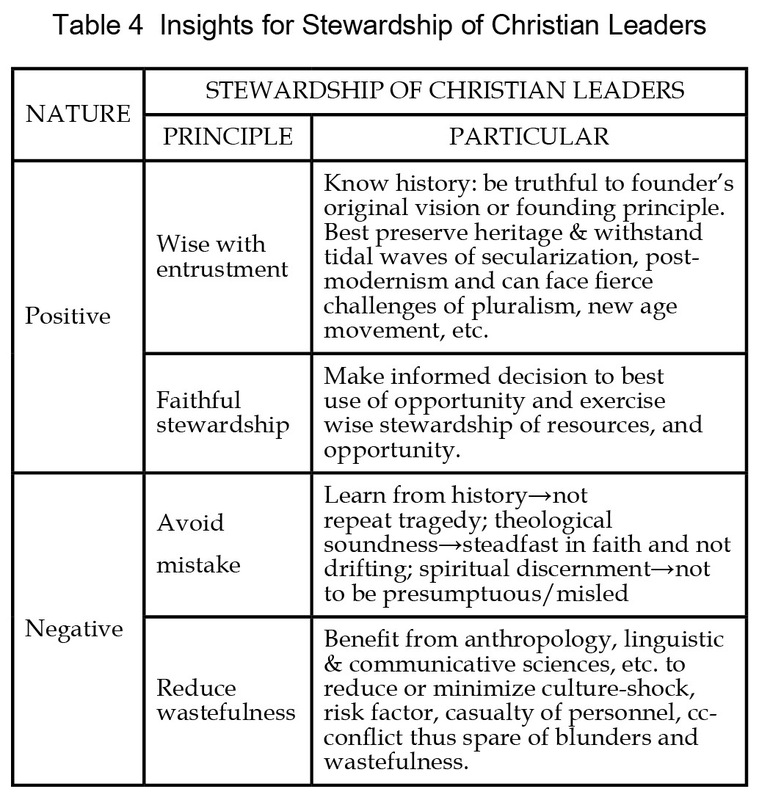 Missiological research is an essential part of healthy stewardship and godly leadership. 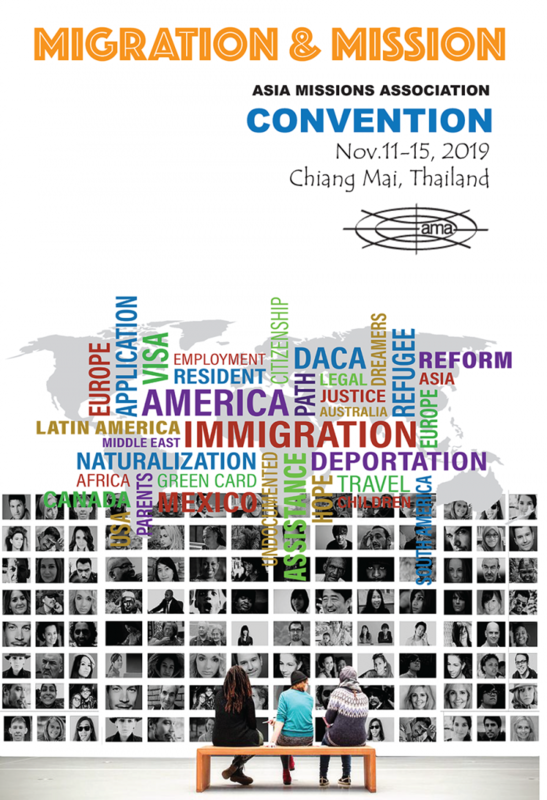 For example, the LCWE movement (Lausanne Congress of World Evangelization) has formed committees to conduct research on holistic mission, BAM (business as mission), diaspora missiology, etc. In addition, there are other missiological research groups, e.g. the “Center of the Study of Global Christianity” at Gordon-Conwell Theological Seminary, Joshua Project of Frontier Ventures, and Global Research of IMB (International Mission Board) of Southern Baptist Convention. 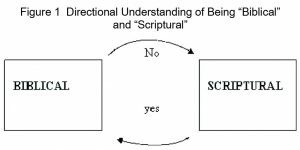 In this paper, we began with definition of key terms, then use diagrams to explain the importance and significance of missiological research, proceed to explain the “what,” “why” and “how” of inter-disciplinary and integrative missiological research. Examples are given to illustrate the points practically. “Shalom” – The opposite of “shalom” is described in John 12:31; 1 John 3:8; 5:19 and Jesus had overcome the world and the evil one who is its ruler (1 John 2:13-14; 5:4). Shalom is a Hebrew word with connotations of peace, wholeness, and wellness in the context of right relationships with God, people, and nature (Jer 33:8-9; Job 5:24; Ps 30:11; Isa 11:6, 9; 53:5). Enoch Wan, “’Mission’ and Missio Dei: Response to Charles Van Engen’s ‘Mission defined and described’” IN Missionshift: Global Mission Issues in the Third Millennium, Edited by David J. Hesselgrave and Ed Stetzer. 2010:41-50. 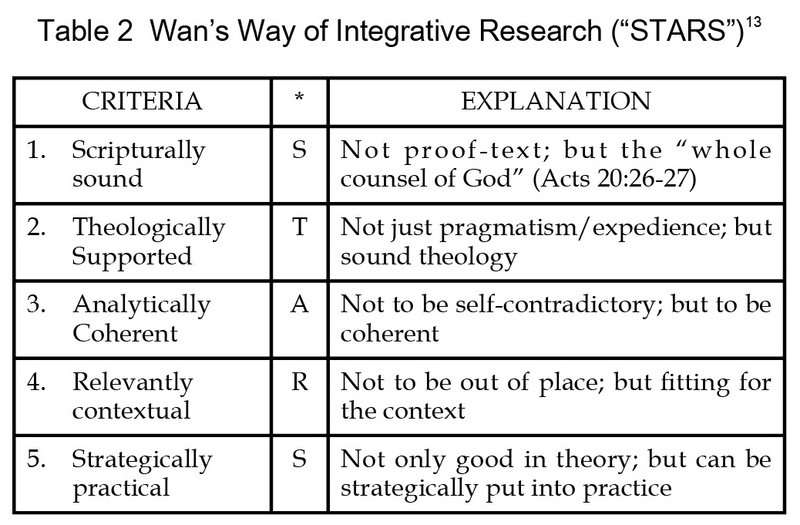 Enoch Wan, “The Paradigm & Pressing Issues of Inter-Disciplinary Research Methodology,” Published in Global Missiology, Research Methodology, January 2005, www.globalmissiology.net. 2005:2. The seven points of this section is taken from (pages 3-4) the article listed in footnote #6. The seven points of this section is taken from (pages 5-6) the article listed in footnote #6. 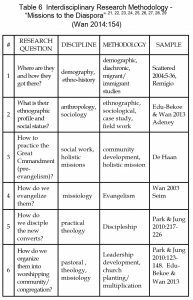 Enoch Wan, Diaspora Missiology: Theory, Methodology, and Practice. IDS-USA, 2012; Yaw Attah Edu-Bekoe, Enoch Wan, Scattered Africans Keep Coming: A Case Study of Diaspora Missiology on Ghanaian Diaspora and Congregations in the USA. IDS-USA, 2013. Enoch Wan, “The Paradigm of ‘Relational Realism.’” EMS Occasional Bulletin 19:2 (Spring 2006):1-4. ______. “Relational Theology and Relational Missiology.” Occasional Bulletin 21:1 (Winter 2007): 1-7. Religious syncretism is a taboo for evangelical practitioner due to unreserved accommodation! 即圖二第五項，便是本末倒置。有關功能論的評估，參下列兩篇專文： Enoch Wan, “Critique of Functional Missionary Anthropology” His Dominion, Canadian Theological Seminary, Canada. 1982. Enoch Wan, “Core Values of Mission Organization in the Cultural Context of the 21st Century,” Published in www.GlobalMissiology.org “Featured Article” January 2009. Enoch Wan, “Core Values of Mission Organization in the Cultural Context of the 21st Century,” Published in www.GlobalMissiology.org “Featured Article” January 2009:6-7. 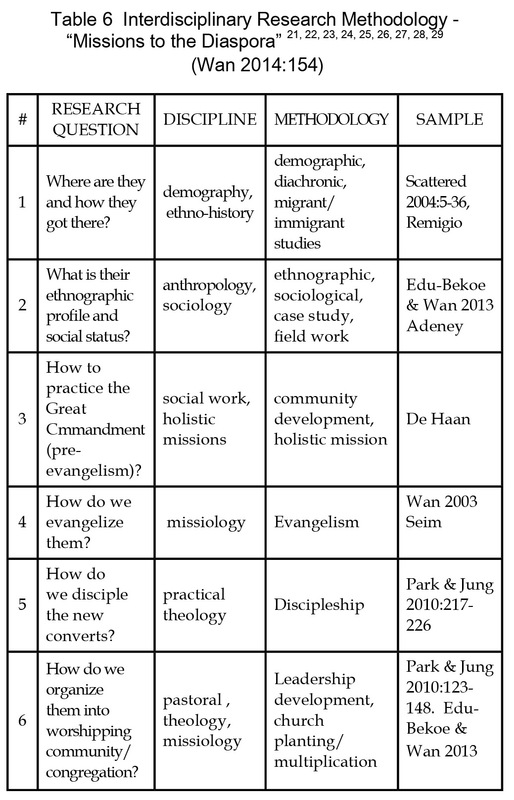 This section is derived from an early work: Enoch Wan, “The Paradigm & Pressing Issues of Inter-Disciplinary Research Methodology,” Published in Global Missiology, Research Methodology, January 2005, www.globalmissiology.net, p. 4-6. Enoch Wan, “The Paradigm & Pressing Issues of Inter-Disciplinary Research Methodology,” Published in Global Missiology, Research Methodology, January 2005, www.globalmissiology.net. P.13-14. Amador A. Remigio, Jr., “A Demographic Survey of the Filipino Diaspora,” in Scattered: The Filipino Global Presence, eds. Luis Pantoja, Jr., Sadiri Joy Tira, and Enoch Wan (Manila: Life Change Publishing, 2004), 5-36. Amador A. Remigio, Jr., “Global Migration and Diasporas: A Geographical Perspective.” in The Human Tidal Wave, by Sadiri Joy Tira. Manila: Lifechange Publishing, Inc., 2013. Charlene de Haan, A Canadian Case Study in Diaspora Missiology, accessed September 23, 2009; available at http://www.lausanneworldpulse.com/perspectives.php. Yeong Ae Kim, “Ammi Mission Fellowship” in 21C New Nomad Era and Migrant Mission ed. Chan-Sik Park and Noah Jung (Seoul, Korea: Christianity and Industrial Society Research Institute, 2010), 217-224. Young-Sang Ro, “The Ecclesiastical Approach for the Integration of Multicultural Society: Intercultural ‘Unity in Diversity’ in the Multiethnic Ministry, ” in 21C New Nomad Era and Migrant Mission. Seoul: Christianity and Industrial Society Research Institute, by Park, Chan-Sit and Noah Jung, eds.2010, 123-148. Thomas Alan Harvey, “Pluralism, Multiculturalism, and the Diaspora Mission: Discovering the Relevance of Apostolic Mission Today.” in The Human Tidal Wave, by Sadiri Joy Tira. Manila: Lifechange Publishing, Inc., 2013. Thanh Trung Le, “A Missiological Study of Vietnamese Diaspora,” Unpublished dissertation, Western Seminary, 2013, chapter 3. Sidiri Joy Tira, “Diaspora Missiology: An Ethnographic Study of Filipino Kingdom Workers, An Enthographic Study,” Unpublished dissertation, Western Seminary, 2008. Steven A. Camarota, Immigrants from the Middle East: A Profile of the Foreign-born Population from Pakistan to Morocco. Washington D. C.: Center for Immigration Studies, 2002. Elizabeth Boosahda, Arab-American Faces and Voices: The Origins of an Immigrant Community. Austin: The University of Texas Press, 2003. Raphael Patai, The Arab Mind. Rev. ed. Tucson: Recovery Resources Press, 2007. Miriam Cooke, and Bruce B Lawrence, Muslim Networks: from Hajj to Hip Hop. Chapel Hill: The University of North Carolina Press, 2005. Phil Parshall, Muslim Evangelism: Contemporary Approaches to Contextualization. Rev. Ed. Colorado Spring: Biblica, 2003. * This paper was originally published in Chinese. Engaging in Global Mission(往普天下去). A quarterly publication of Hong Kong Association of Christian Mission. January to March, 2014. Dr. Enoch Wan is the Director of Doctor of Intercultural Studies Program, Western Seminary, USA. Former President, Evangelical Missiological Society of US & Canada.